Giovanni Dienstmann on meditation for the 21st century mind. As humble as he may be, with more than 18 years and 8,000 hours of meditation under his belt, it’s no exaggeration to say that Giovanni Dienstmann has dedicated his life to seeking personal growth through meditation. Read on as he shares some of his experience. What do you think is an easy, unintimidating way for beginners to start integrating meditation into their routines? The best way to get started is to keep things really simple. Decide a time of the day when you will meditate—ideally in the morning, before the rush of the day starts. Then choose an 'anchor habit', which is something you do every day, to be a reminder for you to meditate. It could be brushing your teeth, changing clothes, stretching, whatever works for you. Finally, decide that every day you will sit for meditation right after that activity, even if only for 5 minutes. Starting small is very important. Don't be too greedy, or you will stretch your motivation and soon get frustrated or bored. Five minutes of meditation every day is a great start. If you don't know which technique to do, simply breathe deeply through your nose, and count your breaths, from 10 to 1. When you arrive in 1, start again from 10. Let your thoughts and feelings flow by like clouds in the sky. Don't bother about them – just make sure you keep part of your attention with your breathing and counting. Once you get used to this, then learn more about meditation, and gradually increase your practice, adding one minute every week. Can you describe an instance in your life where meditation has equipped you with the tools to combat a situation most effectively? Hundreds of times, meditation saved my day – especially when dealing with difficult people and adversities. The daily practice of meditation changed the way I deal with things. Instead of heating up and reacting, I just observe what’s happening outside and inside of me, and am able to respond to the situation more effectively. Everything seems to flow more easily. I have more willpower, focus, and feel happier in general. So when problems come my way, I respond to them from this warmer place, and it makes a difference every time. As people progress with their meditation practice, what are some discoveries you think they will make that may surprise them? They will discover that they are not their thoughts and emotions, but their observer. This is a surprising discovery for most people, because we are so used to identifying ourselves with our thoughts, and believe them. But when we realise that we are under no obligation to believe our thoughts, they no longer have the power to oppress us. We have found a state of internal freedom, and there is a joy to that, which is hard to describe. A memorable moment from your experience as a coach/teacher? What are some common misconceptions about meditation you’d like to dispel? Some people think that meditation is only for people who are stressed, anxious, or are in a spiritual search. But in fact, meditation is for everyone – because everyone has a mind, and meditation helps you master your mind. Without meditation, our mind is often our boss, telling us what to think, what to feel, and how to see the world. Just as physical exercise is for everyone, and not only for the ones who are overweight, meditation is for everyone, and not only for those who are stressed. Pushing forward the limits of human potential, for myself and for my readers and clients. 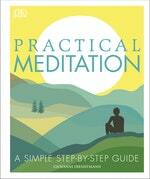 A practical guide to fitting meditation into your busy life.